It can feel like a real kick to the groin when your youngster speaks to you in a nasty tone of voice. For all you've done for her, it would be nice to get some respect in return! But responding with your own rude comment (though satisfying) isn't the best strategy, no matter your youngster's age. Bite your tongue while you pinpoint what's prompting the sassiness. Ages 3 to 6: You're witnessing the first signs of autonomy. He's figured out that he's different from you — and he's letting you know it. At this age, he doesn't know that those defiant comments aren't so nice (after all, people on TV call each other "stupid" all the time – and maybe those words have also slipped from your lips). Don't overreact, but do let him know that he's hurt your feelings. Keep cool, and then move on. Ages 7 to 11: Now, she's talking back to test your rules and reactions. Instead of stooping to her level, model respect so she learns how to express her needs and thoughtfully negotiate for what she wants. Call her immediately on offensive behavior (e.g., "Telling me to 'shut up' in that rude manner is unacceptable"). Humor can tickle the funny bone of school-age children (e.g., "Okay, would you like to try saying that another way?"). If the insulting behavior continues, ignoring it is the surest route to ending it. She's trying to get a rise out of you. If you don't engage, she'll get bored and stop. 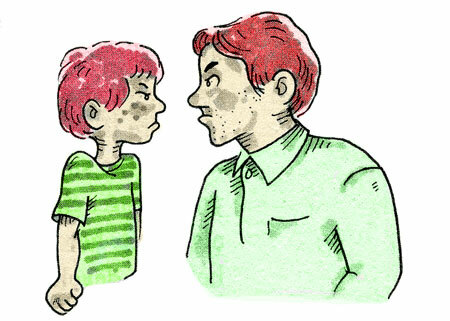 Ages 12 to 17: Insolence peaks at this age, and you need a thick skin to resist the temptation to fight fire with fire. That smart mouth he has is exactly that — he's more articulate and aware. And your opinions, once viewed as the absolute truth, are now highly debatable. One way to figure out who he is and what he stands for is to challenge you on just about everything. But at this age, back-talk may also be a cover-up for feelings of inadequacy, anxiety, or fear. Perhaps he flunked an algebra test, had a fight with his girlfriend, or didn't get a part in the school play. So he takes it out on you. Surrounded by critical, sarcastic schoolmates, he may simply be treating you the way his peers treat each other. Instead of dwelling on his disrespectful attitude, try something similar to the following statement: "You seem really mad lately. I'd like to find out what's bothering you and how I can help." Children this age respond to genuineness. What if he's consistently disrespectful? Refuse to respond until he changes his attitude. Ground him or take away privileges (e.g., no cell phone, no TV, an early curfew, missing an important social event, etc.). That will tend to get his attention fairly quickly.